The people of Costa Rico are called Ticos. We are meeting many friendly Ticos. Especially in the small town of Santo Domingo they are very hospitable. In the streets they all say “hola” or “buenas dias/tardes”. But… we have to get used to some of their specialties, for instance how they give directions, prepare coins carefully in the bus or walk carefully in the streets. When I went to Costa Rica for the first time six years ago, I received the following directions to our homestay: Start at the Scotiabank, walk four blocks uphill, pass a car seller, walk up to the bridge and then turn left to follow a large paved road… But six years later, the Scotiabank building has disappeared, and people might have forgotten that it has ever been there. The road description has to be revised. When I wanted to join one of the processions early in the morning of Good Friday, a friendly policeman told me to walk 100m south and 200m east. I was puzzled, but it was impossible to get another direction. 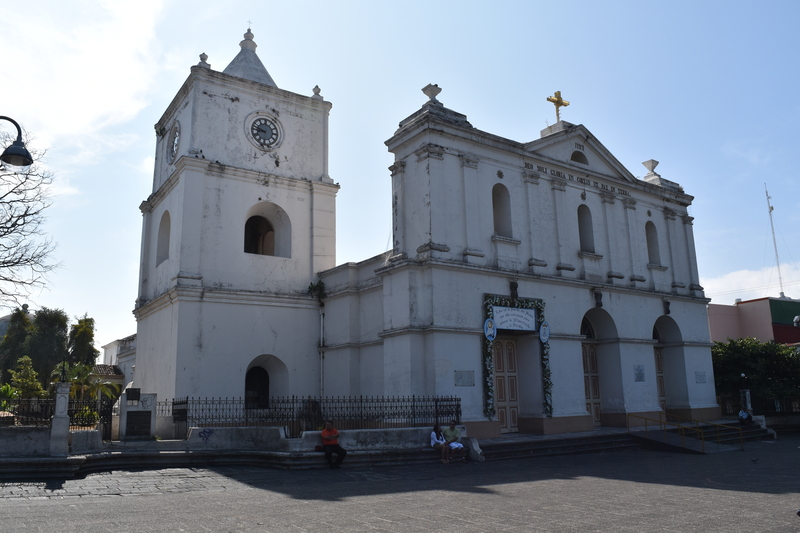 Hence I went 100m south and 200m east… and arrived at the second large church of Santo Domingo. Aha! Yes, the procession has ended here, and the statue with Jesús in his green gown was inside this church, where a sermon was just about to start. 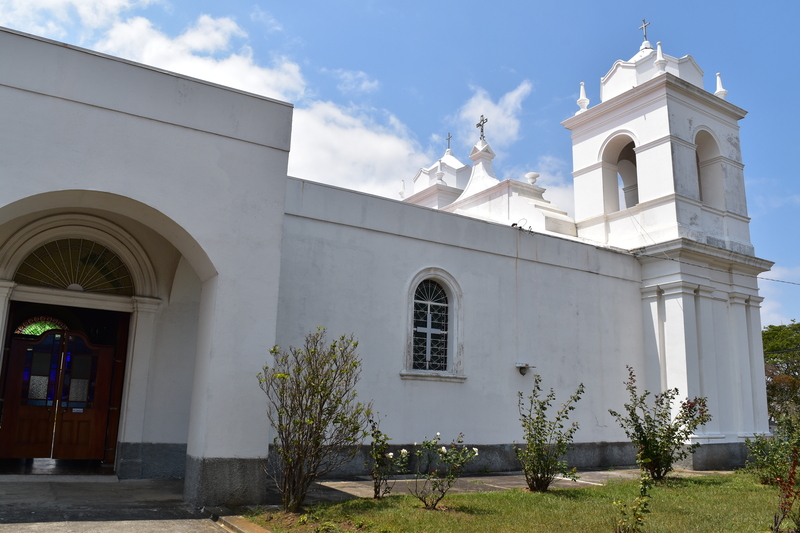 Why could the friendly policeman not tell me to go to the Iglesia del Rosario? Then I would have known where to go… but that does not conform to a Tico’s mind. When we drove to Heredia, I had prepared 950 Colones in coins. This was stupid, two tickets costed only 850 Colones. The busdriver mumbled something and gave me back all the coins. I started over again, giving him 500 Colones – and was about to add the rest. He throws the 500 back at me. I stop, think, prepare 850 Colones (which is the precise amount)… and now he takes my coins nodding. Why has he not just given me back 100 Colones in the first place? … and Ticos are dynamic car drivers. Heredia is the nearest place that is more “towny” than “our” Santo Domingo. Charo explains to us that the bus station is close to Macdonalds, 100m away from their home. As soon as we arrive at the bus station, the bus comes around the corner. 15 minutes later we are in the middle of a vibrant town that is about to wake up. It is a university city that has kept its colonial center. The Calle Central takes us uphill. The shoe shops and some dress shops are already open, and I have to be careful not to start emptying these inviting shops… Their choice is excellent. 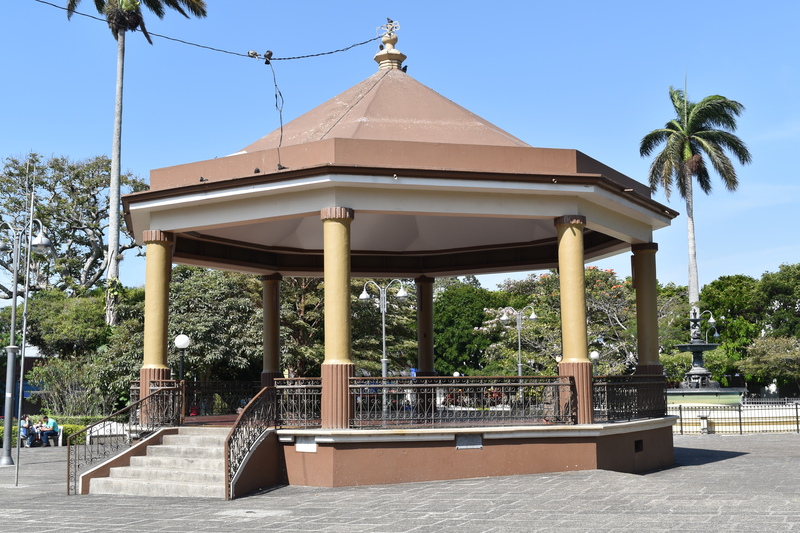 We reach the welcoming Parque Central with its music pavillon. The Basilica de la Immaculata Concepción from 1797. The sun stands behind the basilica right now. The walls are fortified and the church has withstood all earthquakes so far. 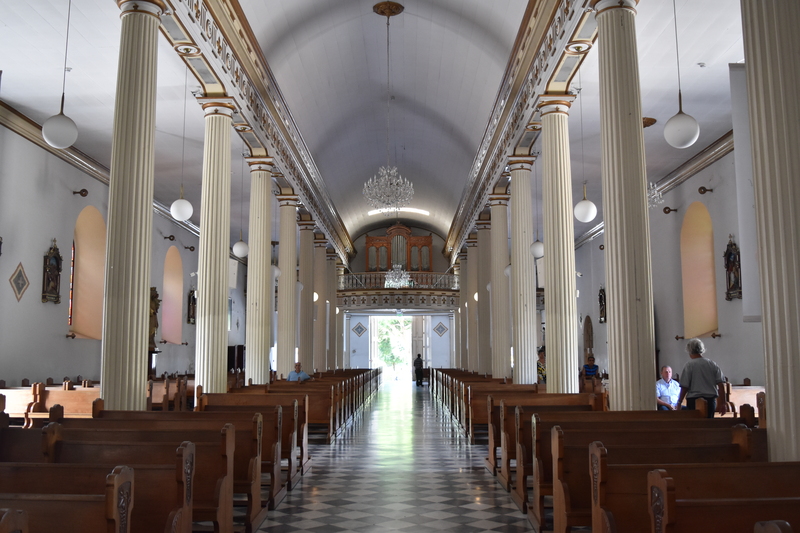 The church is simple inside with white columns. I like to be in churches that are not too much adorned. 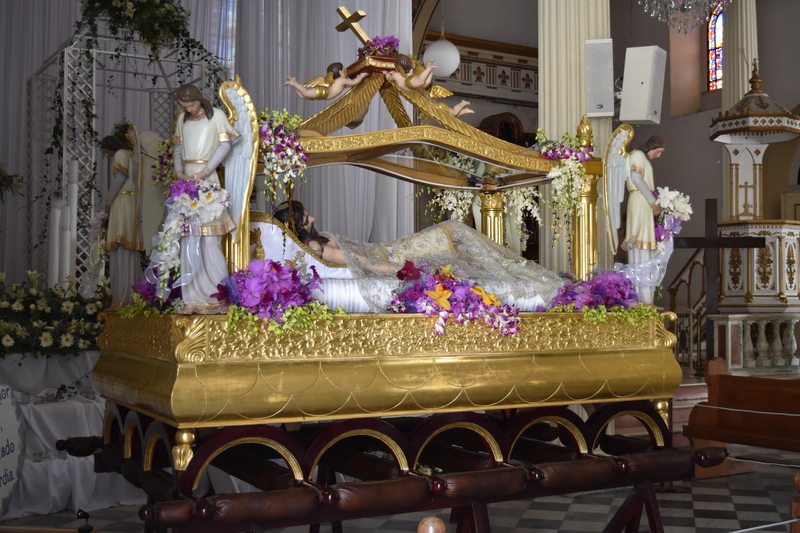 Near the choir, a statue of Jeús rests in his grave. The central square is a vivid place with stone benches that invite to sit down and have a chat. 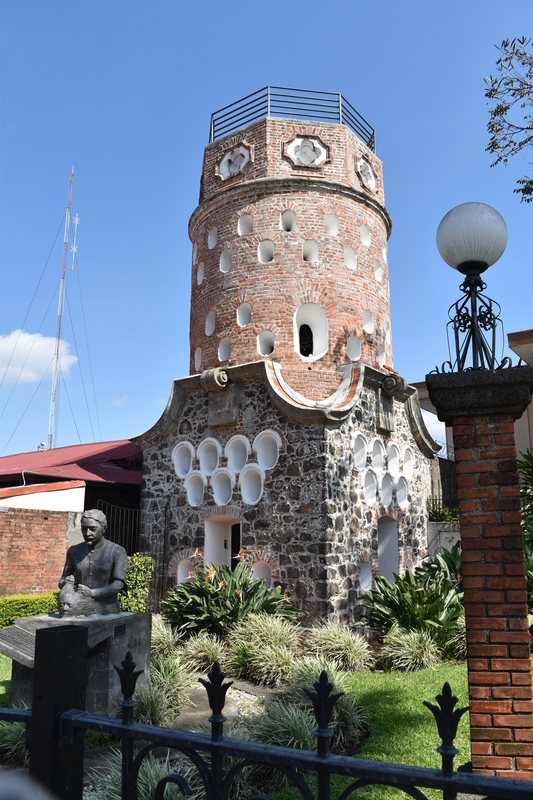 There is the Fortín, a tower that cannot be visited. We read that it is not safe. 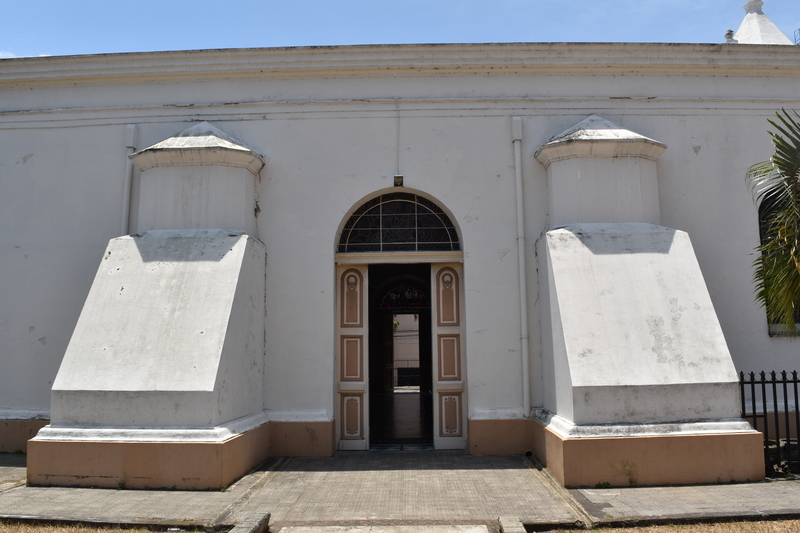 La Casa Cultural is an old colonial style house, now closed. We keep on trying to remember the names for the tropical vegetables and fruits such as guyaba, maracuya or marañon. There are also food stands, but we decide to try one of the restaurants in the city. We end up in the China-Japanese Principe and have a Sushi meal with noodles. This makes a change to the everyday rice you get at Costa Rica. 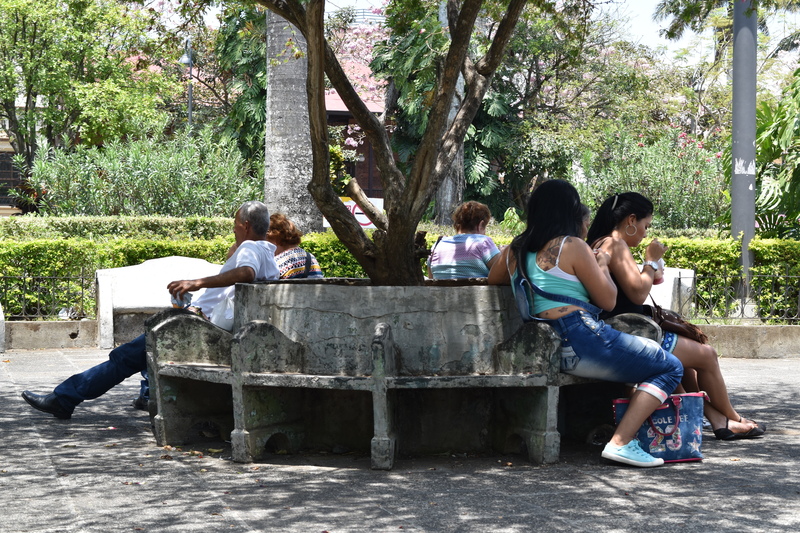 We top the excursion with an Italian ice cream sold by the Gelaterio Golosa… the Costa Rican fruit flavors are enticing – I have a green cas ball and we eat our ice creams in another shady park, the Parque del Carmen in front of the namsake church el Carmen. 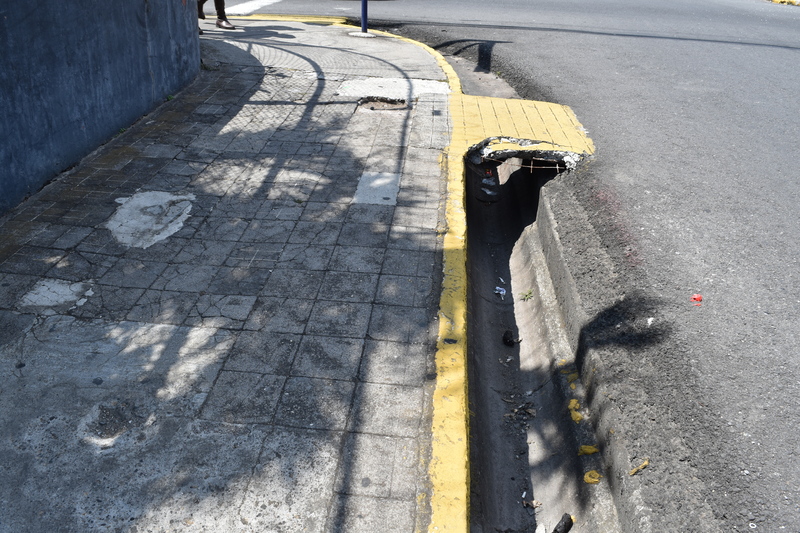 In the early afternoon we take the bus back to Santo Domingo, hop out in front of MacDonalds and two minutes later we have reached our Costa Rican hone. 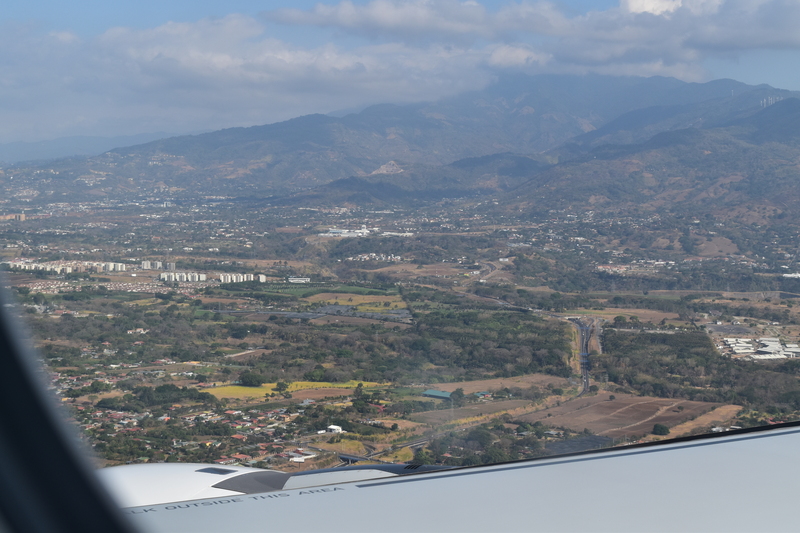 We enjoyed to see Heredia, but we are happy that we have decided to stay in Santo Domingo to learn Spanish. It is more relaxed, and everyone greets us with a friendly smile in the streets. With Ursula, I have traveled before – to Mongolia and to Florence. Now we are heading to Costa Rica to brush up our Spanish, to travel and to meet my family. Our adventure starts in the Easter Week, or as it is called in Spanish, die the Semana Santa. In Zurich we catch the tram at 5 AM. At the airport we buy some chocolate. 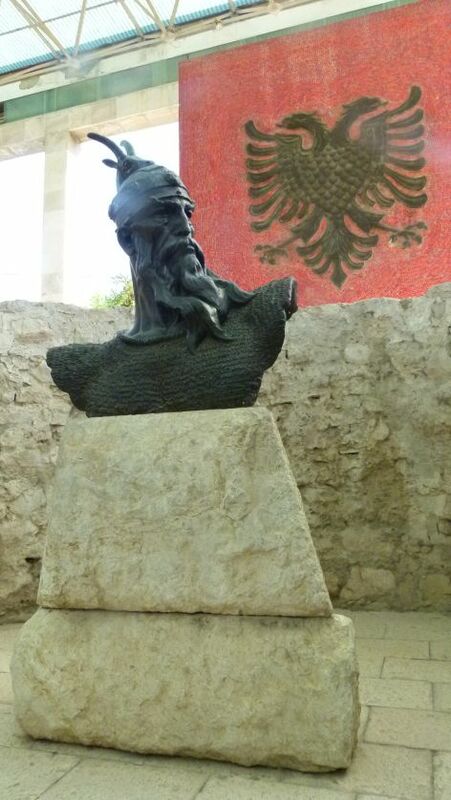 The Kosovo Albanian shop-keeper loves to hear me say “falemers” and “s’ka problem” and gives us some red Lindt chocolate balls on top of the pralinés we bought. Our Iberia plane leaves safely and takes us south along the Swiss Alps – what a gorgeous view. We change planes in Madrid. 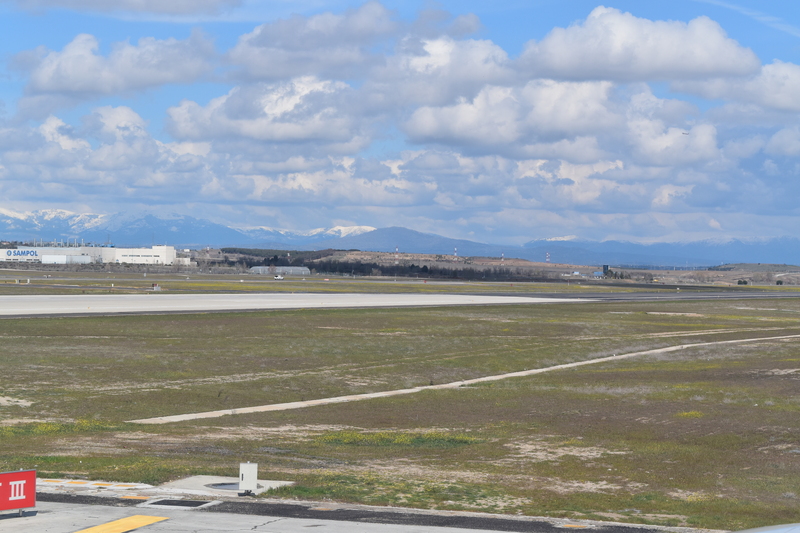 We take off with a view of the Pyrenés. We then have to sit patiently in our window seats for eleven hours crossing the big pond. We land safely at 3:30 local time in San José. 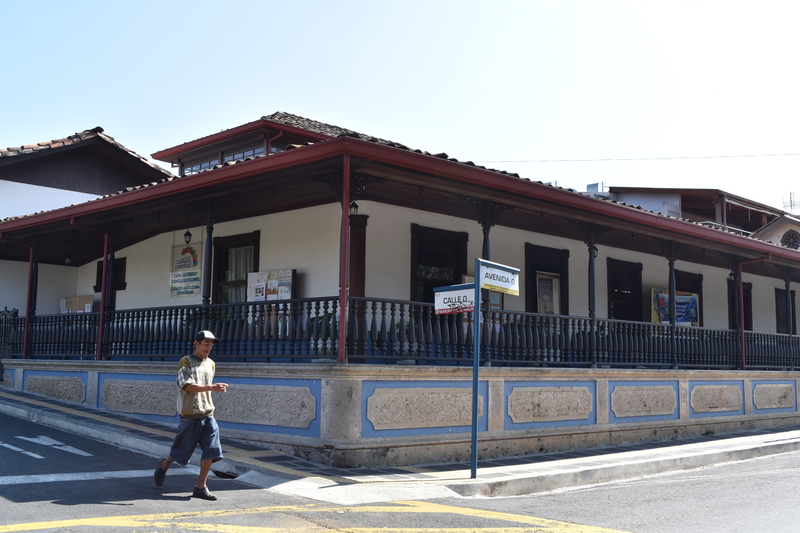 Jorge takes us to santo Domingo de Heredia, a suburb of San José, where we will stay for four weeks. Of course, Jorge offers us an excursion for tomorrow. May be next week, Jorge. The family of Charo gives us a hearty welcome. Only Bony, the little teckle, is not happy to see new guests and barks and barks, but he stops after one day and accepts us to be part of the family. 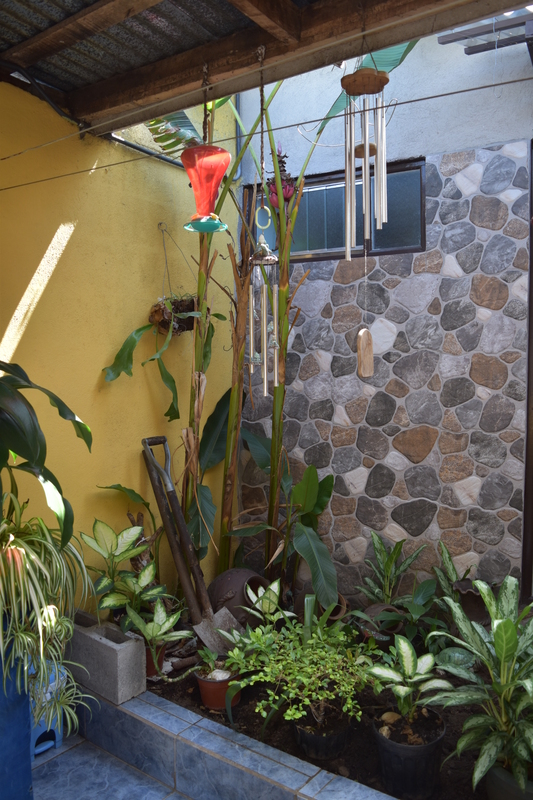 We find two rooms with small bath rooms facing a courtyard with a nice garden. We go shopping with Charo to get a first overview of the area. We enjoy dinner, and then, we are extremely tired. 22 hours ago we have started our journey. I fall into my comfy bed and sleep deeply into the next morning, here in Costa Rica. After a good breakfast with fresh tropical fruits we have a chat with José and Charo. Then we head off to discover our new small town. 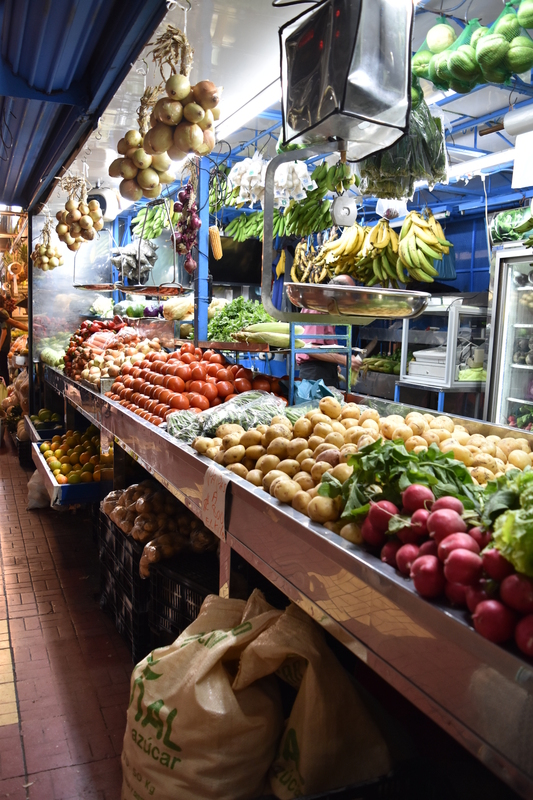 We find many nice shops, bakeries (we buy empañadas), a stationary shop (we buy cuadernos quadraticos or notebooks), a super market (Pali, we buy water, tea and biscuits) and a bank (no money exchange without a passport). In a super market we try to remember the names for the vegetables such as pepino for cucumber. There is a church surrounded by a garden with tropical plants (Iglesia de Nuestra Señora del Rosario). 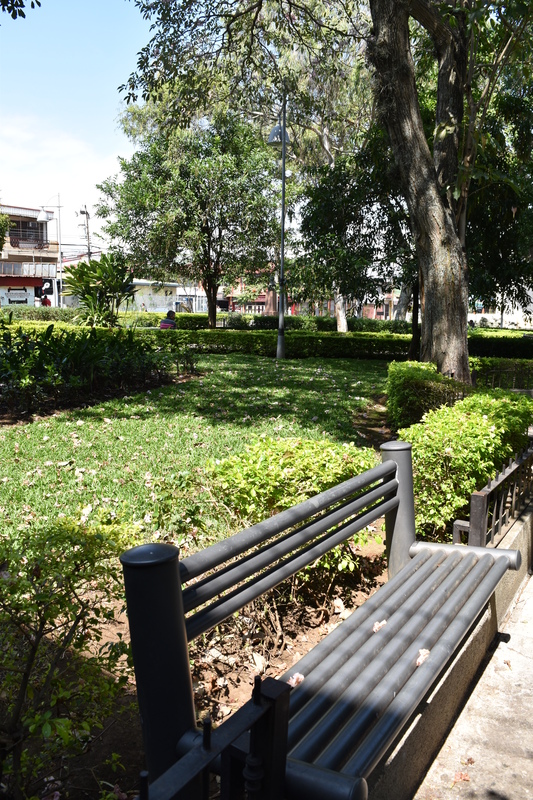 Nearby is a small city park in the very center of Santo Domingo – the palm trees are bending under the wind. 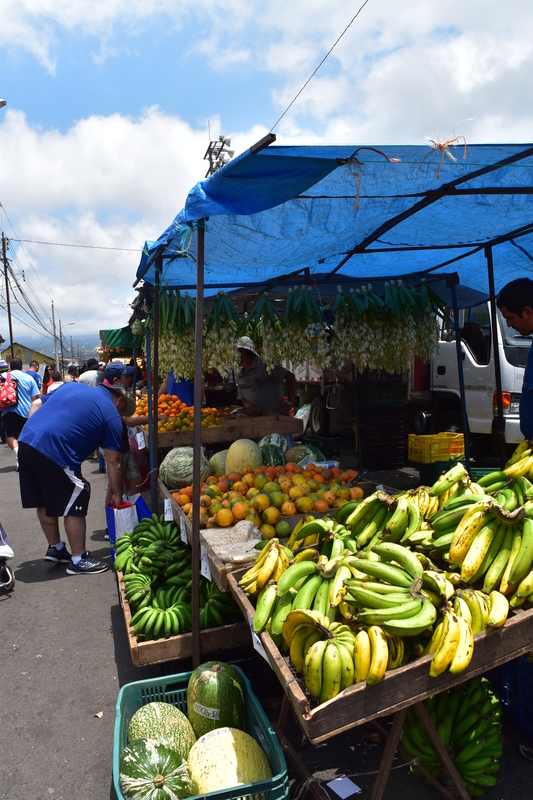 In front of the Basilica de Santo Domingo de Guzmán is a food market. We buy bananas and a mango. The basilica is being adorned for the service and procession tonight. It will be the “Santa Misa y Procesión solemnel dedicada a Jesú atado a la columna.” This is Maria, ready for the procession. 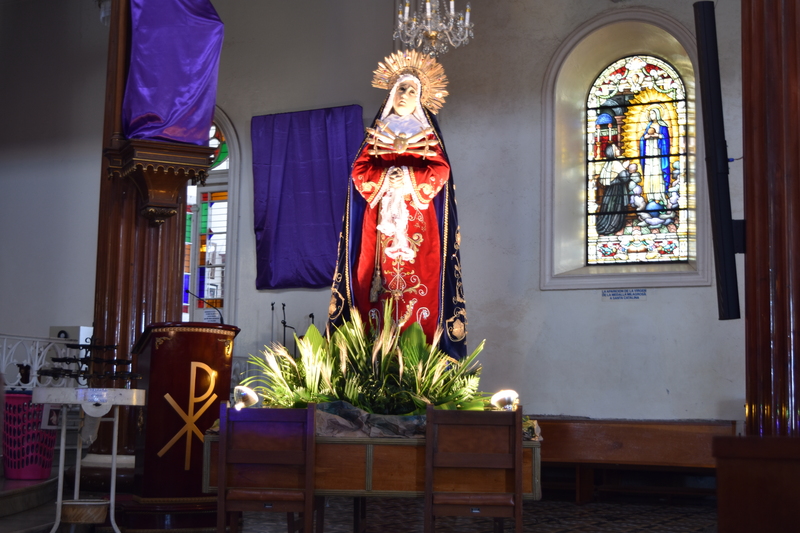 We look forward to some of the services and processions of the Semana Santa. Wonderful, I will be a godmother (Gotte) – what does that mean? Around Christmas, I try to calm down my nephew’s half year old son – I am his grand-auntie. Not his auntie, his GRAND-antie. Then my nephew asks me, whether I would be the godmother of my grand-nephew. I feel touched. Yes, of course, I agree. I have never been a godmother before. Another new adventure at my – not so young- age. I look forward to that and start to think about what matters. After looking back to my childhood and listening to friends I think that care and love matter, being authentic and reliable, finding an atmosphere of trust, and living this by creating habits, by exchanging, by showing you are always there when needed and – yes, also – by making presents that will be remembered. It all has to come from the heart. Accept that this is a mutual relation and enjoy that. And it may become a friendship that lasts beyond the age of 20. My godfather was Onkel Nante and my godmother was Tante Christine. Onkel Nante must have been my age (around 65), when he started his journey with me. He was my mum’s uncle and my grand uncle. He lived in Berlin. I could feel his love in the carefully selected presents, in the letters we exchanged and during my visits in Berlin. One present I remember were the Christmas angels singing “Holy Night”. It was a music box with a windup mechanism, and after some time, the tune would slow down: H-oo-oo-ll-yyy—- n-iii… and then it would fade away. These angels accompanied me every Christmas. 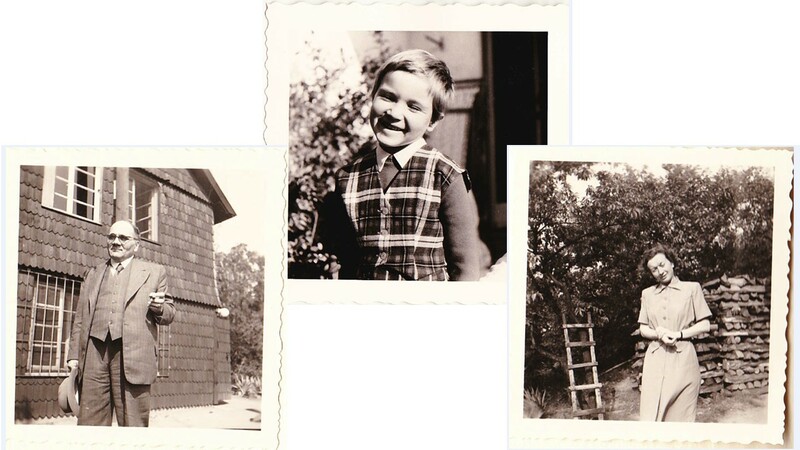 When I was seven, Onkel Nante gave me a skirt with a matching vest, modeled after the red-green-white Scottish kilt, and I was proud of wearing it for many years – I also wear it on the foto. Then I received a summer dress in ice rose – so beautiful. And, when I was fifteen, he had a blue costume made for me to cover my (temporary) overweight. I often exchanged letters with Onkel Nante and his wife. Both were always interested in my life. When I was a student, I traveled to Spain staying in a tent, and I sent him a travel report. The result: An angry letter to my mum: “Please give your daughter enough money to stay in a hotel – tents are extremely unhealthy!” He was more than 80 years old by then, but he was still worrying about me. When I started studying economics at university, he sat down with me, looked at me firmly and asked, whether I will be able to earn a living with that. So – what I remember, are some great gifts and his loving care. And today, I always go to see his house in Berlin, not far from the mosque, to – virtually – say hello to him (his house has been sold). My godmother, Tante Christine, was a friend of my mum’s and lived in Köln. She always lived alone and may not have had a lot of opportunities to travel. I have not met her often. But we regularly exchanged letters, and she always selected her gifts with great care. For my birthday and for Christmas, she would send me jumpers – they always became my favourite jumpers. I particularly remember an ice blue jumper. Through the letters and her gifts I could also feel her love. One day my letters were no longer answered. I was very sad. I think she must have been lonely and sharing her love with me was also important to her. In my first summer with Ernst I heard him mumble: “My godson left a message on the answering machine. He wants to spend a few days with me. I will pick him up at the train station.” We had a few wonderful days – I particularly remember the mini golf tournament that he won. Sometimes we all would take the camper, roast sausages, sleep near a lake in the mountains, go for hikes and climbs or visit the caves in the area. In winter we went out skiing. Every Christmas, Ernst renewed the subscription to “Spick”, a scientific newspaper for kids. After having finished school, the godson shyly said that perhaps he does not need the “Spick” newspaper any more. Now he is a scientist himself, and for his doctorate exam, Ernst promised him a globe based on his specifications… a wish that I eventually fulfilled, when Ernst was already a star watching over us. There was this regular tradition of presents and also sharing time and adventures. The relationship carried on into adulthood and I inherited it in a way after Ernst had left us. From various friends I gathered their godfather and godmother experience. A friend of mine had a godfather that was a farmer with nine children: “He was not rich. But every birthday and every Christmas, he gave me a five franc piece (Fünfliber). He slipped it firmly into my hand looking at me with warm and kind eyes. I loved these moments. And they came back every birthday and every Christmas, with regularity. Being able to rely on this regular gift was very important for me”, he pointed out to me. A couple told me that they had selected a very good friend as the godmother for their daughter. It all started well, but then the friendship broke. The godmother wanted to give back her duty. But the mother said: “Well, you may give back your godmother duties, but do not tell my daughter. She is very proud of you and she loves to think of presents for your birthday and for Christmas. We do not want to take that away from her.” So, the daughter, not knowing about the problem, continued to handicraft presents for her godmother. Eventually, the friendship between the parents and the godmother was restored and the daughter had never noticed the problem… Yes, the relationship between godparents and godchild is mutual. My friend from Munich (now also in her sixties) told me that she has just visited Tante Bärbel in the hospital. She is her godmother and is now in her nineties. The friendship with the godmother lasted far beyond her childhood – beautiful. And her husband added that he valued the advice of his godparents that added an independent view to the opinion of his parents. … and I do hope that I will be able to accompany my godson into his adulthood.